The new IBM eServer i5 servers extend the IBM eServer iSeries family. They are the first servers in the industry based on the leading-edge IBM POWER5 64-bit microprocessor. Today’s eServer i5 servers give the flexibility to move from one generation of technology to another without disrupting a company’s business. IBM i5/OS Version 5 Release 3, the next generation of OS/400, features support for multiple operating systems and application environments on a single, simplified platform. eServer i5 servers do more with less. 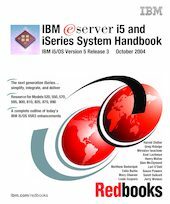 This twenty-seventh edition of the IBM eServer i5 and iSeries System Handbook, distributed and respected worldwide, supports these latest iSeries announcements. It provides a product and feature overview of the newest eServer i5 Models 520, 550, 570, and 595. It describes the newest release of operating system software, i5/OS V5R3, as well as iSeries Models 800, 810, 825, 870, and 890. Information is featured to present all aspects of today’s eServer i5 servers, from the architectural foundation to performance considerations. This Handbook is written for IBM System Specialists, Marketing Representatives, Business Partners, and Clients to answer first-level questions. It offers a comprehensive guide to the iSeries models, associated hardware, and OS/400-related software currently marketed by IBM representatives.